If you love the colorful graphics of cardboard advertising boxes from the past, here is one that will catch your eye. 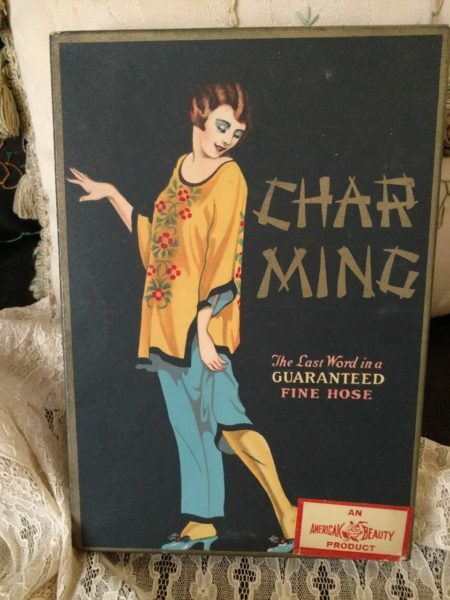 The box lid features a vintage 1920’s lady in her Asian influence pajamas, offering the last word in fine hose. Oh yes, so stylish, the Char Ming, an American Beauty product stockings / hosiery. Box once held a size 9, style H/77, color P.Rock, according to the label on the end of the box. If you collect vintage lingerie, stockings etc, this box would be a unusual addition to tuck into a collection.